The BJP leader said the Congress and the AAP are not very different from each other. 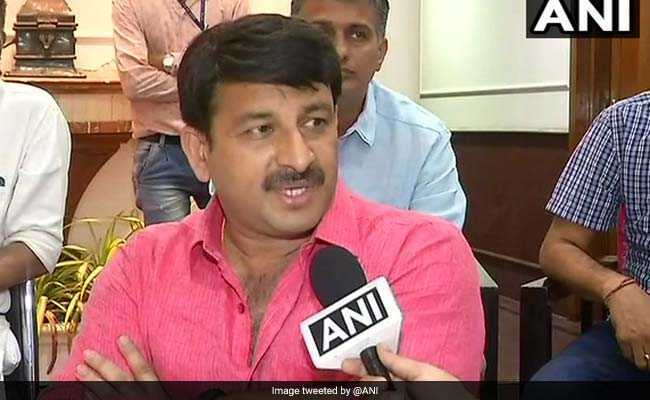 Delhi BJP president Manoj Tiwari Friday termed Delhi Chief Minister Arvind Kejriwal as "a big example of an urban Naxal" and said the AAP and the Congress are chips of the same block. Mr Tiwari, a Lok Sabha MP, asked the Congress to clarify its stand on controversial statements made recently by party leaders Raj Babbar and Navjot Singh Sidhu. "Some urban Naxals are plotting to kill Prime Minister Narendra Modi. Arvind Kejriwal is a big example of an urban Naxal," he said at a press conference this evening. "Being a chief minister, he (Kejriwal) sat on a dharna to stop the Republic Day parade," the actor-politician said. Mr Tiwari targeted UP Congress chief Raj Babbar for his reported statement describing Naxals as "revolutionaries" and also Punjab Cabinet Minister Navjot Sidhu for hugging the Pakistan Army chief during his visit to the neighbouring country. "Raj Babbar ji says Naxals are revolutionaries. On the other hand Navjot Singh Sidhu praised Pakistan and hugged Army Chief there. Congress should clarify its stand on both the issues," he added. "Congress and AAP are 'ek hi thaili ke chatte batte' (chips of the same block). Both parties had earlier formed a coalition government in Delhi. AAP is a B team of Congress," he said, hitting out at both the parties. Praising Chief Minister Raman Singh's government in Chhattisgarh, Mr Tiwari said the ruling BJP has effectively tackled the menace Naxalism in the state and brought misguided people to the mainstream. "Efforts are underway to bring those who were misguided (and joined Naxal ranks) during the Congress rule, to the mainstream," he added. Mr Tiwari was in the state to campaign for his party for the second phase of elections on November 20 covering 72 assembly seats. The first phase of polling, covering 18 seats, was held on November 12.